Print artist Stephanie Purcell will bring her love of the Missouri River to the Fred Simon Gallery in her self-titled solo show which runs from July 11-August 19. Sponsored by the Nebraska Arts Council, the exhibition will host an opening reception for the Omaha artist Friday, July 15, 5-8pm. 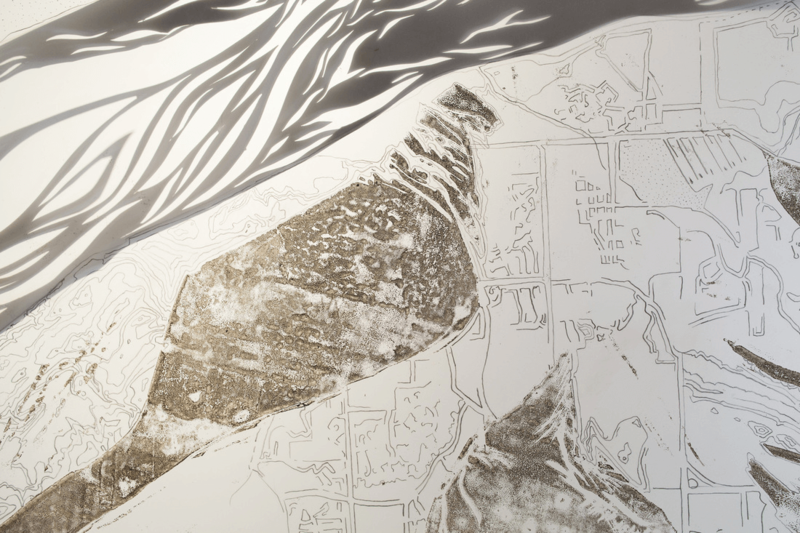 Only her second solo effort in Omaha, the exhibit will include an install of relief prints on acetate with cut paper from her Missouri River series as well as new work that elaborates on similar themes and interests in both subject and process. Purcell says her media is “primarily concept driven,” as she experiments with a mix of waxed relief prints and drawing to create her riverscapes. So influenced by nature, Purcell works for the Girls Scouts Spirit of Nebraska and as a camp director for Buford foundation, helping Omaha youth develop while connected to the natural world. The artist has shown at UNO and the Tugboat Gallery in Lincoln and her first solo effort was at Petshop Gallery in 2013. Stephanie Purcell runs from July 11-August 19, at the Fred Simon Gallery, 1004 Farnam Street, Plaza Level. For details go to artscouncil.nebraska.gov.